Dr. Roger E. Dickson was born on September 1, 1947 into the farming family of Edgar and Wanda Dickson of Stafford, Kansas, U.S.A. He is married to Martha Jane, having four children, Angella, Matthew, Cindy and Lisa. Being of the spiritual heritage of Bible-students of central America, Dr. Dickson has continued the legacy of those who firmly believe that the Holy Spirit inspired Bible is our final authority in all matters of faith. As an ardent student of the Bible who began his studies of the Bible in the early 1960s, Dr. Dickson has written numerous books, Bible study manuals, a commentary on the entire Bible, and an easy-to-read revision of the King James Version. His writings have influenced millions of people. His literary works have been published throughout the world and translated into several languages. The English material has been published on this website in order to stimulate Bible study by those who are of the character of the Bereans who received the word of God upon the foundation of their desire to learn and obey the truth of God (Acts 17:11). 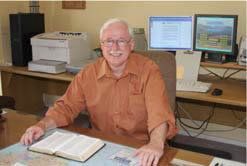 The purpose of the africainternational.org is to establish a forum around which faithful Bible students can have their minds challenged by the writings of Dr. Dickson. Though the material of this website has been written by one person, it is the prayer of the author and publishing staff that everyone will investigate their Bibles in order to substantiate the validity of what has been written by Dr. Dickson. Paul’s admonition to the Corinthians was, “Be imitators of me even as I also am of Christ” (1 Corinthians 11:1). The editorial staff thus calls on everyone who investigates the writings of this website to do so with the spirit of focusing on Christ as the final authority for spiritual leadership. Discipleship is encouraged, therefore, through the investigation and obedience of the word of Christ. Jesus admonished, “If you continue in My word, then you are truly My disciples” (John 8:31). This is the prime objective of the staff who publishes this website. They are ardently concerned that men continue in the word of God, for only by doing such is one a true disciple of Jesus.